Fun trivia to share with those friends? Maybe not. No worries! We’ve got your back. 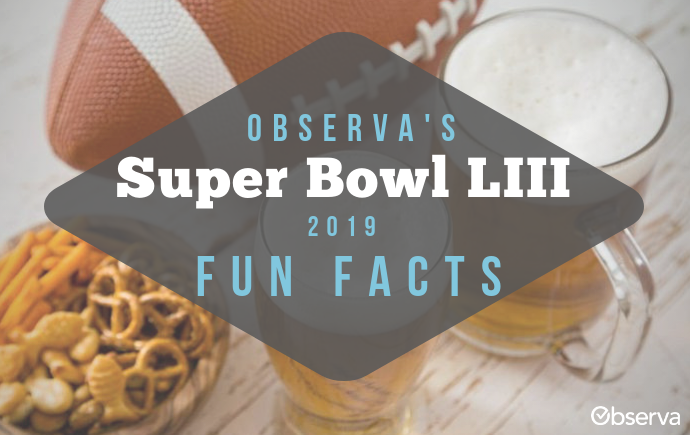 Observa is back to provide all the fun facts one could need at a Super Bowl party. Awkward conversation before the game begins? Pull out a fun fact about boats or beer intake. How about the stock market? No? Well then, that leaves a Super Bowl fact about musicals. This year’s Super Bowl is packed with crazy facts to keep everyone entertained. For readers who don’t care about football (or the commercials), we’ll remind you that Super Bowl LIII is scheduled to take place on February 3, 2019, at Mercedes-Benz Stadium in Atlanta. 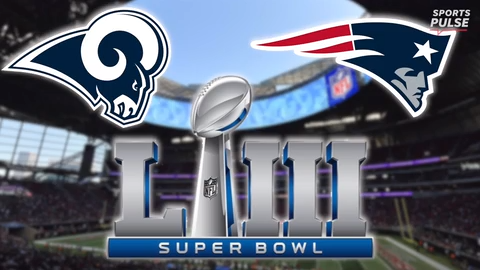 The New England Patriots will face the Los Angeles Rams, and as usual, the trash talk has begun. Commercial costs. A 30-second Super Bowl commercial will cost over $5 million this year. For reference, a normal “Thursday Night Football” commercial of the same length would cost $434,078, and the 2016 average for any national broadcast commercial was $123,000. That’s a lot of money. Cheerleading. This will be the first year that male cheerleaders will perform in a Super Bowl. 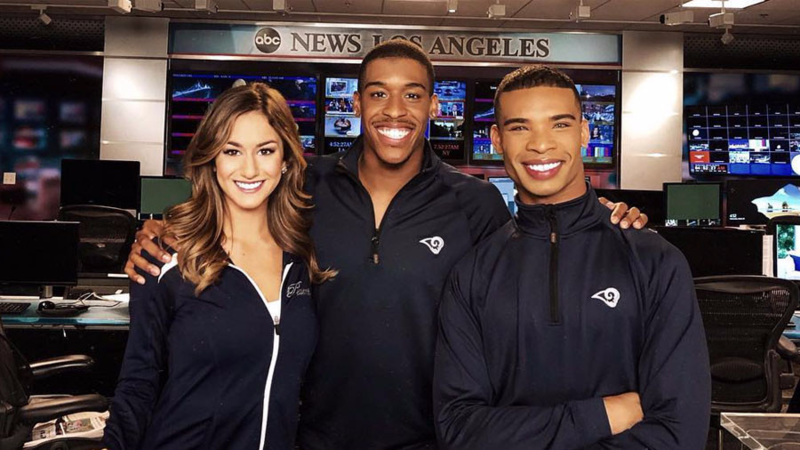 Los Angeles Rams cheerleaders Quinton Peron and Napoleon Jinnies will be appearing on the field with their team. Players: Tom Brady, 41, will break his own record as the oldest starting quarterback in the Super Bowl. On the flip side, Rams running back John Kelly will be the youngest on the field at 22 years old. To put this into perspective, when Kelly was born, Brady was finishing his freshman year of college. Belichick’s boats. Head coach of the New England Patriots Bill Belichick has quite the history with Super Bowls. After winning six Super Bowls, Belichick bought a boat and named it VI Rings. After his 2017 win, he upgraded to a new boat, aptly named VII Rings. You can probably imagine the team that his boat dealer will be cheering for. Kia: Kia is known for featuring expensive celebrities in its past Super Bowl commercials, such as Melissa McCarthy, Steven Tyler, and Pierce Brosnan. However, this year the company announced it will shift its “celebrity budget” to offer scholarship opportunities for kids to access higher education. Skittles: Skittles recently announced its “Broadway Musical” plan for the Super Bowl. 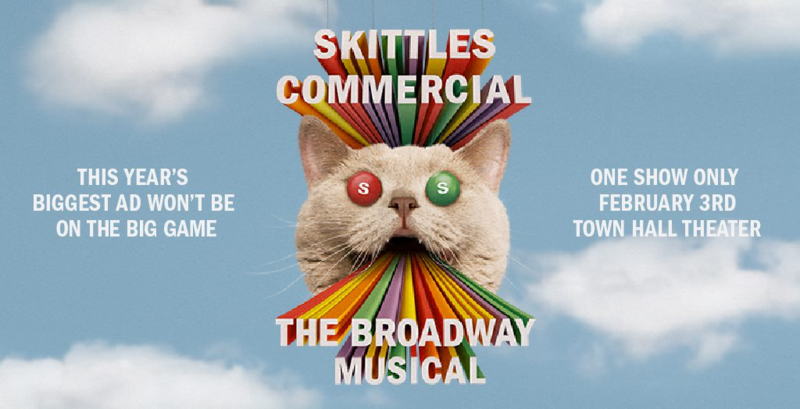 Instead of a commercial, there will be a one-time musical starting at 1:00 p.m. on Super Bowl Sunday in New York City. Olay, Bumble, and Devour: All of these companies will be making their Super Bowl debuts this year. Marijuana: CBS will not allow medical cannabis-related commercials to air this year. With the new legalization in33 states, CBS is facing backlash due to the comparable advertising space provided for the alcohol industry. Beer. Around 50 million cases of beer are expected to sell on Super Bowl Sunday. How much money is the beer industry getting that day? 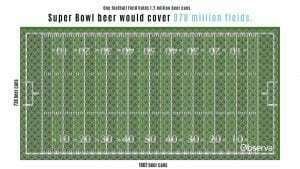 It’s about $10.8 billion dollars’ worth of beer, which could pay for 18 hours of Super Bowl commercial air time. 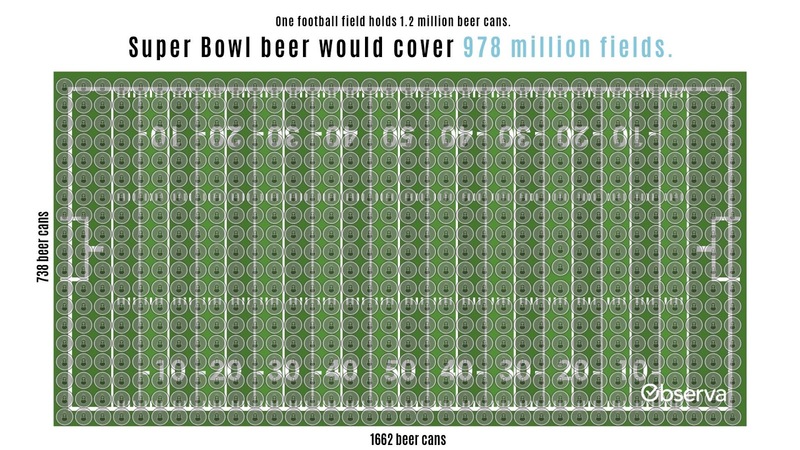 Visually, that much beer could cover almost 1 billion football fields. Pizza. Pizza orders typically increase by 350 percent compared to a regular Sunday. Wings. According to the National Chicken Council, Americans will consume 1.25 billion chicken wings this Super Bowl weekend. Chick-fil-A. 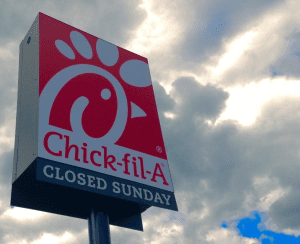 Popular fast-food restaurant Chick-fil-A is never open on Sundays because the company values Sundays as a day of rest and worship. Super Bowl Sunday will be no exception at Atlanta stadium because Chick-fil-A refuses to open its doors that day, even with the prime location in the stadium. Salt. Eleven million pounds of chips are expected to be consumed on Sunday as well as an estimated 4 million pounds of pretzels and 2.5 million pounds of nuts. Antacids. Junk food and beer come at a cost to our bodies as well. Antacid sales see a 20 percent increase the Monday morning after the big game. A great purchase on Super Monday! Toilets. There is an urban legend that because of the sheer amount of people watching the Super Bowl, bathroom breaks line up extremely well across the country during commercial breaks. With that many people flushing at the same time, rumors say that sewage systems suffer during this time. Although there is no concrete evidencearound this, it’s something to think about on your commercial (or game, no judgments here!) breaks. Bulls vs. Bears. 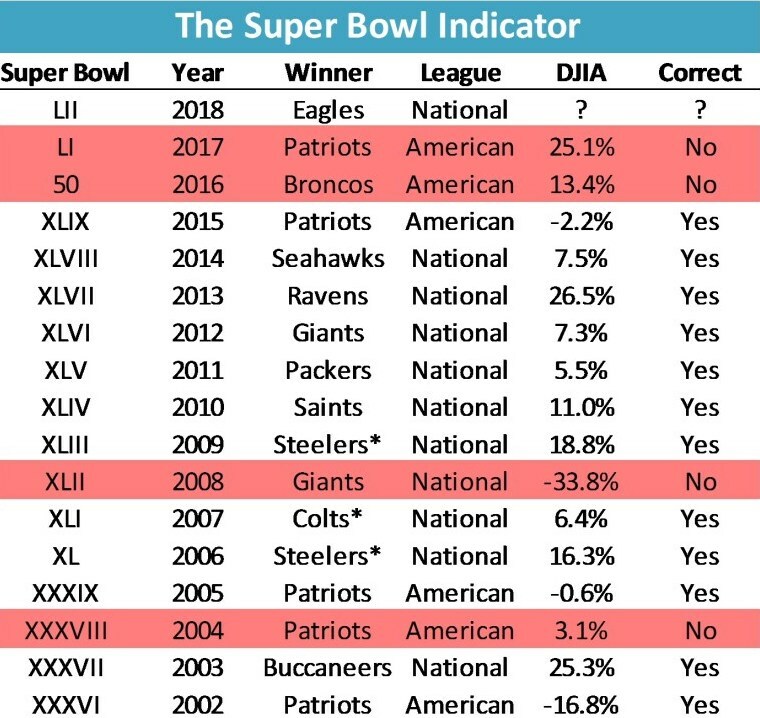 In 1978, sportswriter Leonard Koppett developed a pseudo macroeconomic concept that the stock market depended on who won the Super Bowl. Until that year, there was a trend that if the AFC team won, then the stock market would be a bear market (down). 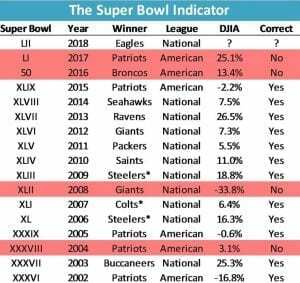 However, if the NFC won, then the stock market would be a bull market (up). As of 2018, this indicator was correct 40 out of 51 times. From us to you, we wish you a wonderful Super Bowl Sunday and a restful Super Monday morning.